Winds around the house were moderate and gusty in the morning, but nothing that the trusty 2 Skewer Dopero kite couldn't handle. Besides, there was a chance the breezes would die down further towards the mid afternoon when we planned to fly. Sure enough, the weather seemed very calm as we pulled up at the only decent sized local reserve that wasn't weed-infested. The prickly kinds of weeds we have around here have a habit of catching the flying line, not to mention parts of the kite and its bridle. After placing the wind meter on the grass, some seconds passed before the little cups even started to spin! No problem, The 2 Skewer Dopero kite has a track record of doing very well in light winds. Even no winds at all, if some thermals are about! A few meters of line were let out to get the kite up for some photos. The small Dopero hovered and climbed slowly in the soft puffs coming through, while I worked the line a bit as well. Perhaps 10 minutes later, fresh gusts started rolling across the reserve. Very sudden, most unexpected and somewhat unwelcome! This wind was possibly associated with the Adelaide Hills only a few kilometers to the East. Gusty gully winds. All of a sudden, the Dopero was straining at the leash, zipping around left right and almost overhead. While still on 20 meters (70 feet) of line, some photos were taken. It's hard to get a sharp in-flight picture when the kite is hundreds of feet up. Flying could be called uncomfortable, with the kite being forced into large loops from time to time, and generally being battered by the wind. A few times, I brought the kite down and tweaked the upper bridle loop knot left or right. This kite is quite sensitive to the knot position, so I overshot once or twice! There were some problems with old tape giving way as well. Most of the spar caps were originals from the day the 2 Skewer Dopero kite was made in November 2008! They do a good job generally, but don't last forever. As usual, I had come prepared with a roll of yellow insulation tape in a shorts pocket. Over the next half an hour or so I ended up replacing or reinforcing most of the spar caps, trying not to add too much unnecessary weight of course. My young son Aren got sent over to the wind meter on an errand - to push the reset button! Otherwise the average might be a bit low due to the earlier calm conditions. Quickly, the kite line went out to 30, then 60 meters. Even so, it was still necessary to bring the Dopero down for another bridle adjustment. It was still hanging to the right in the smoother but rather fresh breeze up there. After edging back towards the Eastern boundary of the reserve, there was room to let out all 120 meters of line. At this length, and due to wind strength being higher than optimum probably, the 2 Skewer Dopero kite refused to go much higher than a 50 degree line angle. Never mind, at least it's having a good high fly! Also, I hadn't thought to shift the towing point forward at all. So the kite was still on its light-wind setting! After taking down the kite one last time, we had the trim pretty close to perfect. But, time was running out and it was decided not to loft it up on the maximum line length again. Plus, both upper sail tethers were starting to pull through due to the unrelenting wind strength. In fact, in the photo up there you can see that the left panel has gone a bit loose. That wouldn't have helped the trimming problems! 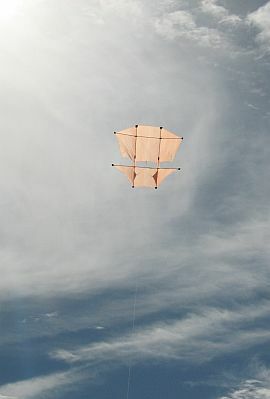 Most reports on the 2 Skewer Dopero kite have focused on its great light-wind performance. However, today was a day for exploring the upper end of this kite's wind range. Just see the video down there! If you have made a 2 Skewer Dopero, be persistent with making tiny adjustments to the upper bridle loop knot. The kite will fly straight as a die when you get it right, even in a fresh breeze. During packing things up, I noticed from the Windtronic 2 anemometer that the wind speed had averaged 7.4 kph at ground level, gusting to 23 kph. Perhaps that was closer to 35 kph up high, judging by the bent-over upper branches of the trees during the strongest gusts! Plus there was heaps of leaf noise.